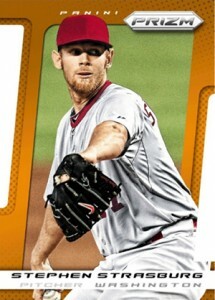 2013 Panini Prizm Baseball marks the brand's sophomore outing on the diamond. Highlights include a growing number of Refractor-like Prizm parallels and new inserts. No matter the sport, Prizm parallels have become a cornerstone for the brand. 2013 Panini Prizm Baseball has several different versions, offering their own take on the Refractor Rainbow. Carrying over from 2012 Panini Prizm Baseball are base Prizms, Gold Prizms (#/10) and one-of-one Black Finite Prizms. Retail-only Green Prizms return also along with Target-exclusive Red Prizms and WalMart-exclusive Blue Prizms. New are Die-Cut Orange Prizms. Numbered to 60, they are available only in hobby packs. Autographs are inserted two per hobby box. Like base cards, these too have parallels: base Prizm (#/25) and Black Finite (1/1). As far as base inserts go, USA Baseball returns with a chromium take on the national team. 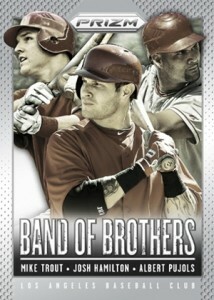 Band of Brothers focuses on teammates. Youth is on display in Rookie Challengers and Top Prospects. Other inserts include Superstar Spotlight and Fearless. All basic inserts in 2013 Panini Prizm Baseball come with Prizm parallels. 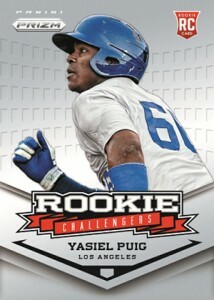 The 2013 Panini Prizm Baseball checklist includes several rookies, led by Yasiel Puig. Jurickson Profar, Manny Machado, Gerrit Cole and Wil Myers are among the set's other rookie cards. J.D. MARTINEZ ORANGE DIE-CUT REFRACTOR 2013 PANINI PRIZM #21 SERIAL #'d 60 60 ! Featuring 300 cards. Shop for base sets on eBay. Good: Clean design, crisp photos, nice use of USA Baseball alumni. Bad: Not much excitement, some poor photo choices, sticker autographs on chromium stock. The Bottom Line: For the most part, 2013 Panini Prizm looks good. It has a solid checklist. It’s reasonably priced. But even with that, it lacks excitement. There’s no pop factor to it that makes me want to delve deeper. I think there are a couple of reasons contributing to this. The main one is the overly complex parallels. With so many exclusives, it leaves very little color for hobby boxes. Also, it’s not overly creative. The design has been used across all sports and there’s little to make it distinct. If you’ve bought any of Panini’s other recent Prizm sets, then you get the idea of the design for the base set. It doesn’t stray much from those used in hockey and football. Thankfully, it looks solid. The colors are bold and the shots stand out. To that end, the set looks good. The parallel Prizms are the highlight, just like their intended. The added color really works. I just wish there was more of them. As with some of Panini’s other baseball sets, there are some issues with the photo selection. There are limitations in what they can do without free reign on logos and jerseys. However, that does not excuse using photos that cover a player’s eyes. The basic inserts are a mixed bag. The USA Baseball cards, which focus on alumni, are my favourite cards in the entire release. Reminiscent of the similar set in 2012-13 Prizm Basketball, the American flag in the background looks very nice with the USA Baseball uniforms. Another standout is Fearless, which makes good use of the chromium stock to bring a big flame to life. 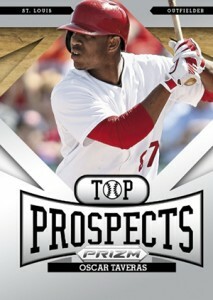 Other basic inserts like Band of Brothers and Top Prospects are okay, but they don’t do much to stand out. The 300-card base set is a nice size for a set like this. Big stars are joined by lots of rookies and a handful of retired stars. The end result is a base set that has some meaning from top to bottom. It’s also a set that is free of any major gimmicks or challenges. The inserts are a little much. I would have preferred a couple of additional Prizms instead. Overall, the autograph checklist is solid. While there are lots of less desirable names, it has several big names and tougher signers like Frank Thomas, Cal Ripken and Mariano Rivera. Of course, they’re tough to land but there is a solid balance. Prizm is a solid break, but it could be better. And I think all it would take is a little more color in hobby boxes. Take the product as a whole and there are plenty of different Prizms. But they’re segmented so much among different pack types and locations, mostly retail. Had there been a touch more in hobby, even one additional level that falls one or two per box, I think 2013 Panini Prizm Baseball would have been that much stronger of a break. While I enjoyed Prizm, it isn’t a grand slam. Unlike hockey, which has nothing like it, it’s tough not to compare this product with Topps Chrome. The overall quality of Prizm is better. The cards are stronger. But the more generic photo choices, sticker autographs and lack of common colors sucked away some of the enjoyment for me. Ryan, those orange die-cuts are numbered to 60. Man, I’d sure like to get one of those finites. I got a Mauer Gold so I’m happy about that. Would like to have seen more color in the prizm family for hobby boxes. Auto checklist has some real off-the-wall players, but that makes it pretty interesting. Good article. shiny, good quality, a few scratch marks every once in a while. Overall, very nice. Liked Panini’s inaugural release last year and think they’ve done an even better job this year. They’ve done a great job in redesigning the entire lineup starting with the base set (which I personally like much better this year). Also nice to see retail getting some early love and attention w/ Target’s Red Pulsar Refractors. Hopefully they continue to stay hot. Chasing auto’s gets old. Quickly. Ok so I JUST bought my first box and am very happy about it! Not Hobby because there is no hobby shop here to buy from so I had to buy a Walmart Blaster Box. BUT I got a Blue Pulsar ( if that’s what they are called, please let me know the right terminology on Walmarts Blue cards,need to know), a Jurickson Profar,3 other Blue Pulsars,6 other Rcs, a Wandy Rodriguez Auto! Need to try and get a hobby box somewhere,but being a disabled Vietnam Veteran money is tight,another reason I have buy from Walmart, but I am VERY Happy with this box for sure! Love the look & design, but way too many base cards in this set. One question…..I pulled a # USA4–STEPHEN STRASBURG/USA BASEBALL COLLEGIATE NATIONAL TEAM card, but I don’t see that card listed ANYWHERE in this checklist. Any ideas? Not sure how the inability to find prices for a product is the the all-encompassing factor for why it gets an “average” rating, but sure. Beautiful cards first set in a long time that I have actually wanted to complete. Comparable to Finest and Chrome sets as far as luster and looks. As far as finding prices, They are listed in Beckett, never had a problem finding prices.